n the band of specialized cells from the neuroectoderm that lies along the outer surface of each side of the neural tube in the early stages of embryonic development. The cells migrate laterally throughout the embryo and give rise to certain spinal, cranial, and sympathetic ganglia. They also influence the ectomesenchyme to form dental tissues. pertaining to a nerve or to the nerves. a group of neuroepithelial cells which condenses dorsal to the neural tube in the embryo; they subsequently migrate and set up dorsal root ganglia, the ganglia of the autonomic nervous system, and the pigment cells of the integument (melanocytes). in the embryo, the sides of the invaginated neural plate that meet and fuse over the neural groove to form the neural tube. the longitudinal furrow in the neural plate of the embryo. 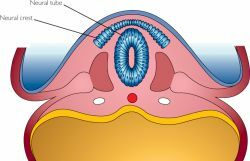 the thickened ectoderm dorsal to the notochord in the embryo that gives rise to the neural tube. separated from the outer layer of the optic retina by the intraretinal space; constitutes the pars optica retinae, with its neuroepithelial layer (contains rods and cones—the receptor cells), bipolar ganglion layer, multipolar ganglion layer, and a layer of axons of the latter layer. Light must pass through the latter three layers before reaching the receptor cells. functional units of the central nervous system, often composed of a series of structural units which may be widely separated anatomically but which interact to support or drive complex nervous system functions, such as hunger and sleepiness. They are the counterparts of simple centers, e.g. the respiratory center, which control simple physiological mechanisms. the tropic influence of nerves on, for example, muscle, demonstrated by the atrophy of muscle when it is denervated. the precursor of the central nervous system in the embryo, formed by invagination and fusion of the neural plate. When those neural crest cells were subjected to conditions mimicking a transient fever, the embryos developed craniofacial irregularities and heart defects, including double outlet right ventricle, Tetralogy of Fallot and other outflow obstructions. A constant target of neural crest cell anomalies,12 the chick thymus has remained a subject of interest for decades. The probable mechanism for the reduced number of ERC's is through inhibition of the expression of fibroblast growth factors in neural crest cells. The new process yields neural crest cells without addition of foreign genetic material. Neural crest cells are required for correct positioning of the developing outflow cushions and pattern the arterial valve leaflets. Like locusts that cringe away from nipping neighbors, neural crest cells repel each other, thanks to a process known as "contact inhibition of locomotion," Mayor and colleagues found. Neural Crest Cells and Cancer: Insights into Tumor Progression. Cephalic neural crest cells and the evolution of craniofacial structures in vertebrates: morphological and embryological significance of the premandibular-mandibular boundary. Given that BMP signaling is key to the formation and migration of neural crest cells and jaw formation depends on this migration, alteration of this signal produces, among other craniofacial bone defects, a severe hypertrophic jaw. Also, Riccardi assumed that a postzygotic somatic mutation, occurring in primitive neural crest cells, is the most likely pathogenesis and thus the lesion should be strictly non-inherited. Neuroblasts are derived from sympathoadrenal lineage neural crest cells and therefore require and constitutively express PHOX2B. In vertebrates, neural crest cells that contribute to pigment cells are also derived from the neural plate border.